I’m always excited to see another movie by Evgeni Bauer, who is probably my favorite filmmaker from the period I’m studying (so far, at least). 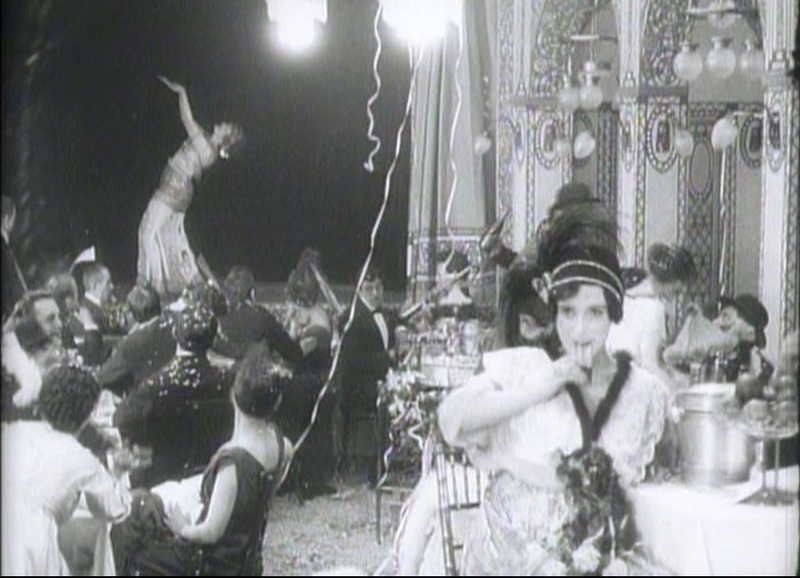 Bauer was more daring than most of his contemporaries, and could see that cinema had the potential to be a new way of telling stories, not dependent on older models like the theater, and he avoided theatrical conventions in bringing his visions to the screen. He also had a taste for unusual content, for stories that one wouldn’t be likely to see in American movies of the time. I’m tempted to interpret this movie as a combination of the “Lost Girl” narrative typical of American movies with the “Vamp” that would become a hit with Theda Bara the next year. But, really, it is neither of these, although common elements can be found. Marya (or Mary, the English Intertitles vary) is a poor seamstress who works in a sweatshop but dreams of romance. One day, while window-shopping, she gets picked up by two young gentlemen who take her back to a fancy apartment for dinner and drinks. She, unaccustomed to the alcohol, rapidly gets drunk and accepts a proposition to become the “companion” of Victor, the younger and less grabby of the men. At this point, the story takes a turn as we are told she is “ruining” her new companion (presumably by spending a great deal of money on clothes, nightclubs, and a nice apartment). He begs her to join him in a more modest lifestyle, but she has gained a taste for riches and looks elsewhere for someone who can provide her the life to which she is now accustomed. Oddly, she chooses the butler for this purpose, but maybe butlers made more in Russia in those days. Victor continues to obsess over her as he sinks into poverty and hangs around the door to her apartment. Eventually, he sends up a note begging to speak to her again, and she dismisses him with three rubles. He dies on the spot, and she runs off with her society friends to Maxim’s. Although this movie wasn’t quite as daring as some of Bauer’s other work, I found it satisfactorily innovative. There are a number of nicely-framed shots, including overheads and a shot up an elaborate stairwell. I liked a shot where we see Marya window-shopping from inside the store, then the reversal where the two men proposition her from outside, to the stern glare of the shopkeeper looking out at them. 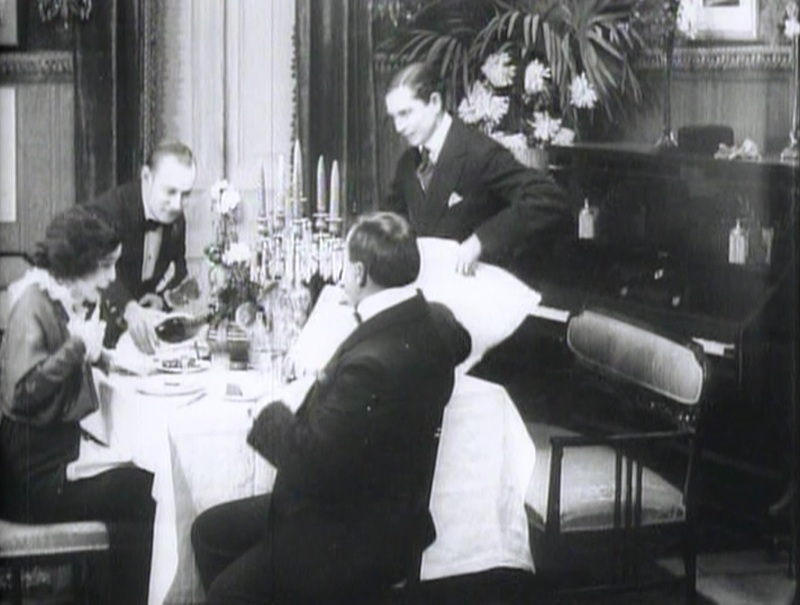 I also was impressed when a scene opened on an elaborate (closed) door to a nightclub, allowing us to just glance through a small glass window as a car pulls up outside, then moments later the door opens to reveal the arrival of the dinner party. In the existing print, the tracking shot into the nightclub dancer is cut into awkward jump-cuts, which may be an experiment that didn’t quite work (for me) or it could be a mistake in the restoration. There’s another good tracking shot backward as Marya leads her followers out into the night, but it cuts a bit too quickly to be fully effective. 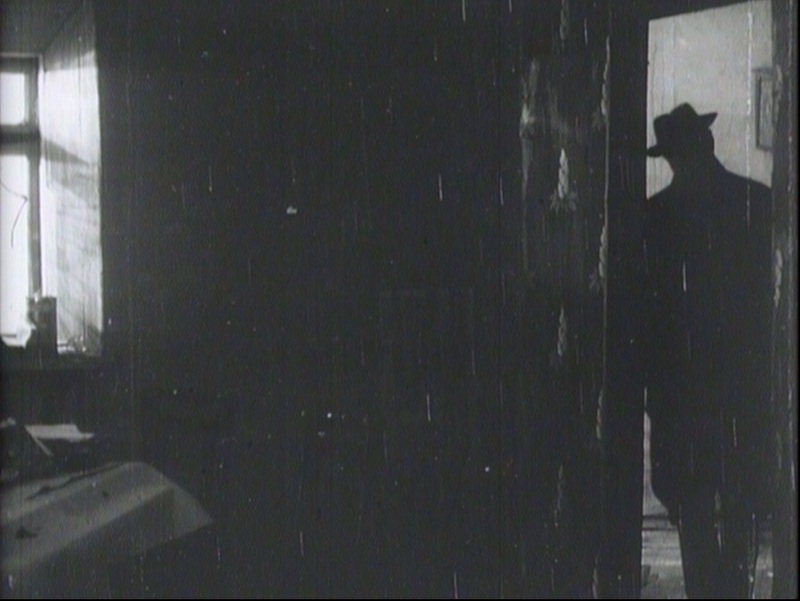 Once again, we also get a good sense of lighting, with practicals that seem to provide actual light on the set, and a great proto-noir shot of Victor in silhouette in front of an over-exposed window. On the whole, Bauer’s cameraman Boris Zavelev avoids “square” set-ups and uses diagonal angles, but where he does shoot straight-on, it’s used to emphasize the lack of choice a character (usually Victor) has in his next move. Many of the sets are heavily decorated with baroque props, emphasizing the conspicuous consumption of the wealthy classes.